The 2010 Major League Baseball Postseason is underway! What a great time to be a sports fan. The divisional round of the playoffs will be covered by TBS and Fox will be broadcasting the NLCS and World Series. If you are stuck at work or don’t have cable or satellite you do still have an option to watch the 2010 MLB Playoffs and World Series online. The actual network broadcast is blacked out online in North America, but with MLB’s Postseason.TV option, you’ll get “companion coverage” to the regular TV broadcast. This package will run you $9.95 and includes every game up through the World Series. 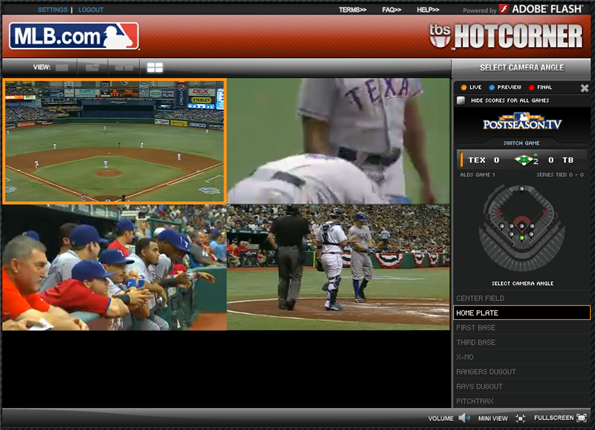 So, what exactly is this “Companion Coverage?” According to MLB.com it means you’ll get to watch 4 alternate camera angles (out of 8 available) at once, get in-game highlights, and even port the content to your iPhone, iPad, or iPod Touch through the At Bat 2010 App. Other than that, they don’t provide much in the way of details. Well, we decided to dive in with Postseasn.TV and see first hand what it is all about and whether and whether or not it’s worth it’s $9.99 price tag. The viewing experience is a bit different. On TV, you are used to seeing constantly switching camera views to get the best angle of a particular situation. With Postseason.TV you are watching just one static camera at a time, so it is it kinda like sitting at the game in that you just get the single view from where you are seated. 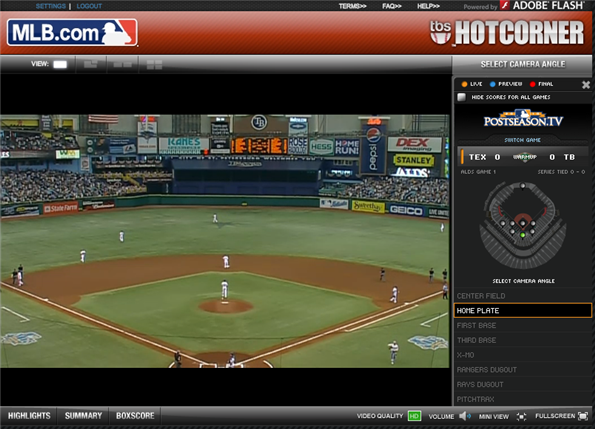 The Home Plate plate view appears to be the best viewing angle for just simply watching the game. You can choose different camera angles. There are 8 different cameras to choose from, and you can watch up to 4 at one time. You can switch to multi-camera setups by selecting the view you want above the video. There is single, picture in picture, split, and quad views. You can select from the 8 available cameras on the right. For multi-view, click on the box you want first and then select the camera to show in that particular box. The big negative I’ve instantly noticed with the multi-camera setup is that not every camera appears to be “synced up.” For instance, in one window I’m seeing Cliff Lee throw a pitch and in the other he’s still getting the signal from the catcher. It’s rather annoying. You can also play in full screen by clicking the button at the lower right. 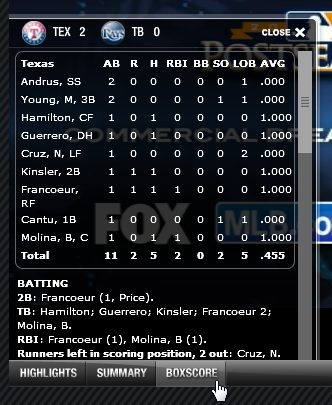 Pull up box scores by selecting it at the lower left. 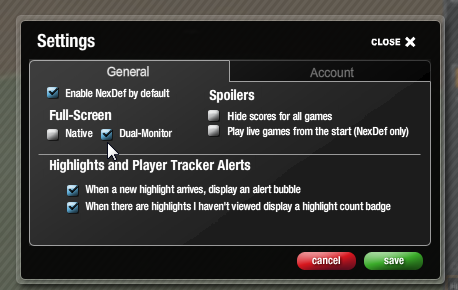 If you are playing on a dual-monitor setup, you’ll want to make a change in the settings so that you aren’t getting kicked back to standard size everytime you click away. Settings is found at the top left. Select Dual-monitor and Save before exiting. In a nutshell, you’ll need a Mac or PC with Adobe Flash installed (at least version 9, but 10 is preferred) Any modern browser should work just fine. For more gory details, see all the system requirements here. I’d say Postseason.TV is a viable option for those without cable or access to a TV. Although, don’t expect the same camera dynamics you’ll find with a network broadcast. I’m not so sure about the companion aspect of it yet, though. I was really looking forward to the multiple views but they are not syncing up which is a disappointment. I’ll watch this along side a game on TV later to get a better feel for the companion aspect of it. Update: I’m not all that thrilled with it as a companion to the TV broadcast. Again, I’m finding that the postseason.tv feeds are not synching up with the TV broadcast very well, thus making the companion aspect less interesting. 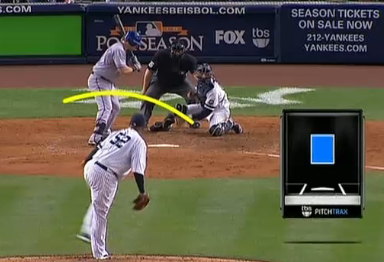 You can check out the 2010 PostSeason.TV for yourself and enjoy the MLB Playoffs online.